At 828 meters (2,717 feet), the Burj Khalifa in Dubai is the tallest building in the world and the tallest free-standing structure. It has over 160 floors, the most in the world, the highest occupied floor, and the highest outdoor observation deck in the world, on the 124th floor. How does one access all of those super-high floors? Why, on the world’s longest elevator ride, of course. That’s longest in distance, not time. The Burj Khalifa’s high-speed elevators travel 10 meters per second. Click for more about the Burj Khalifa. Dubai is famous for its shopping. With over 70 malls and shopping centers, and more in the works, shopping is the city’s top tourist attraction. 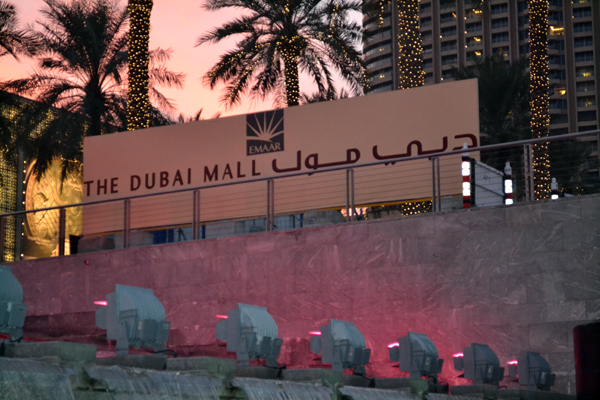 Now, the pinnacle of shopping malls in the world’s best shopping city has got to be something to see. If shopping is your thing, I’m sure you would agree. That place is Dubai Mall, the largest mall in the world, with 1200 shops, including chain stores from around the world, as well as local names, hundreds of places to eat, an ice rink, a theme park, an aquarium (see below), a 22-screen cinema and access to Burj Khalifa, with all of its wonders (see above). 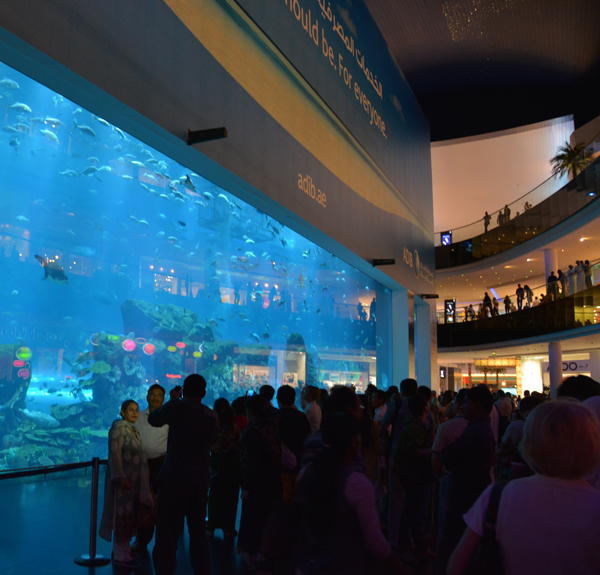 Inside the world’s largest shopping mall (see above) is the world’s second largest aquarium with the world’s largest viewing window – 108 feet long and 27 feet tall. Through the giant window you can watch a mesmerizing ballet of 33,000 marine animals, probably not all at the same time. Outside the world’s largest shopping mall (see above) is the world’s largest dancing fountain, performing every 30 minutes from 6-11pm (11:30 Thurs-Sat). The fountain winds for 900 feet around Dubai Lake and shoots water 500 feet into the air. 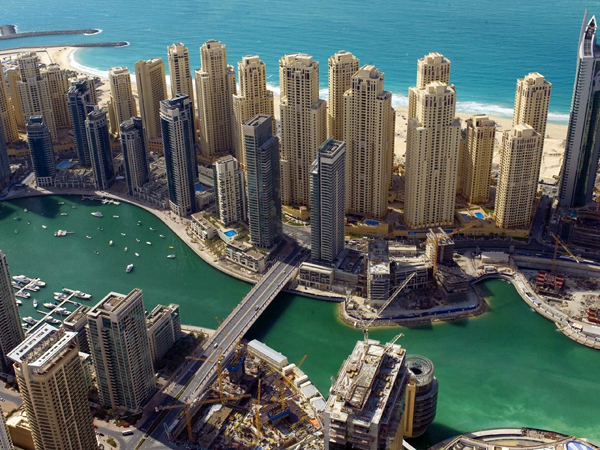 Motivated by the demand for waterfront property, Dubai has developed the largest man-made marina in the world. A two-mile long channel was dredged to let in water from the Arabian Gulf and a city within a city rose up along its shores. 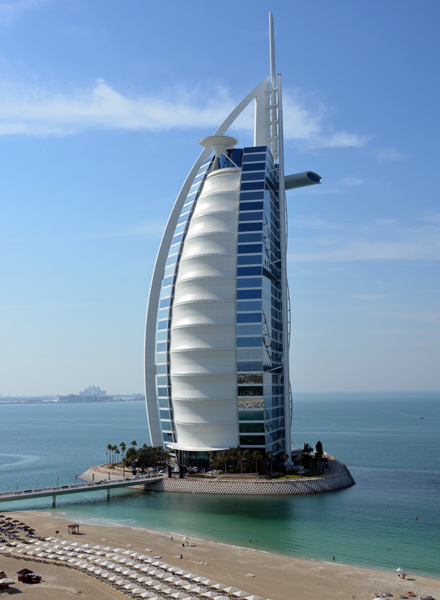 The iconic, sail-shaped Burj Al Arab has been called the only 7-star hotel in the world. Built on an artificial island just off Jumeirah Beach, the only access is by a private bridge (or helipad). Although it’s the world’s 4th tallest hotel, it has only 202 guest suites on 28 double floors. Suites range in size from 1,820 to 8,400 square feet. That’s all the superlatives I have for now, although I’m pretty sure most of the projects mentioned above broke records for speed of construction and money spent. Dubai is nothing if not determined to succeed in tourism. In 2013 it was ranked the 7th most visited city in the world. We’re betting it will do better than that in years to come. Click to see tours to Dubai on our web site. The Burj Khalifa is the tallest building in the world. The project broke ground in January 2004 and building was completed in January 2010. The three-lobed, spiral design was inspired by a desert flower, the Hymenocallis, as well as the onion domes and spiral minarets of traditional Islamic architecture. The three-wing, Y-shape allows more surface area for windows, which maximizes light and views. As the building ascends it streamlines with 27 set-backs, very common in super-tall structures and an engineering devise known to the earliest architects. The Chicago firm of Skidmore, Owings & Merrill (designers of the 1 World Trade Center in New York), with chief architect Adrian Smith, won an international competition to design the Burj Khalifa. 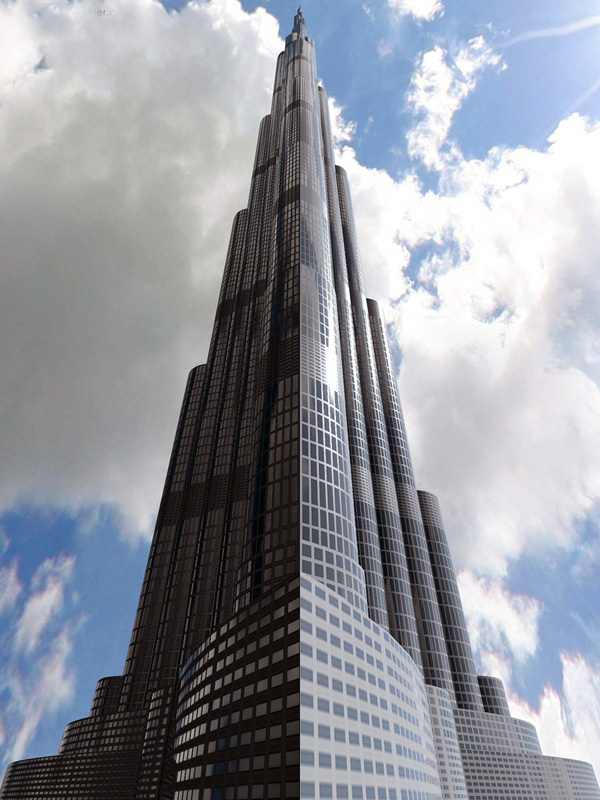 The building stands 2,717 feet tall, with 163 stories. The public observation deck on the 124th floor (At The Top) is the highest in the world. Levels 19-108 are home to some very wealthy people in 900 residences. At the current rate of approximately 3,750 UAE dirham ($1,021USD) per square foot, you can get an 1800 sq ft 2-bedroom apartment for $1,837,800, or you could consolidate and take the 560 sq ft studio for $572,000; micro-living is very trendy right now. (Micro-living in the world’s tallest building, ha ha.) The Armani Hotel occupies 15 floors with 160 guest rooms and suites and 144 private residences. A 27-acre, Hymenocallis-influenced park swirls around the base of Burj Khalifa and is watered, at least in part, by the 15 million gallons of condensation collected from the building’s cooling system each year and stored in tanks in the parking garage. Burj Khalifa anchors the Downtown Dubai development, which also includes the world’s largest dancing fountain on a 30-acre, man-made lake, the Dubai Mall, and The Address Hotel. The Dubai Mall has 1200 shops, over 1,000 places to eat, cinemas, an ice rink, a theme park and a very cool aquarium and underwater zoo, among lots of other stuff to look at and/or spend money on. Check out the Dubai Fountain. It’s pretty. See our tours to Dubai here.